promises the lowest electricity consumption and big annual savings. The summer heat is proving to take its toll not only on our comfort, but our energy consumption as well. With many consumers’ electric bills skyrocketing, Concepcion-Carrier Air Conditioning Company (CCAC) is offering tools to help them cool down and keep electricity costs down as well. More after the jump. CCAC’s new lineup of cooling solutions addresses the need to lower electricity consumption without having to sacrifice comfort. And with its air conditioning units that combine modern function, energy savings and green features, consumers won’t need to worry about next month’s electricity bills. CCAC’s roster of cooling solutions includes the Carrier Optima Window Room Air Conditioner, which gives the lowest electricity cost versus other non-inverters based on rated power input; the Carrier XPower 2 high wall inverter that gives as much as 53% savings versus other inverters; and the Carrier iCool, the air-conditioner with an exclusive 8-in-1 filter, making it 8x more powerful against bacteria, dust, pollution, viruses, and allergens. The secret to the Carrier Optima Window Room Air Conditioner lies under the hood. Its powerful yet energy efficient compressor and additional cooling coils allow the Carrier Optima to deliver the lowest electricity consumption. It also consumes the least power consumption compared to other air conditioner brands in the non-inverter air con category, based on stringent tests done in the CCAC facility. 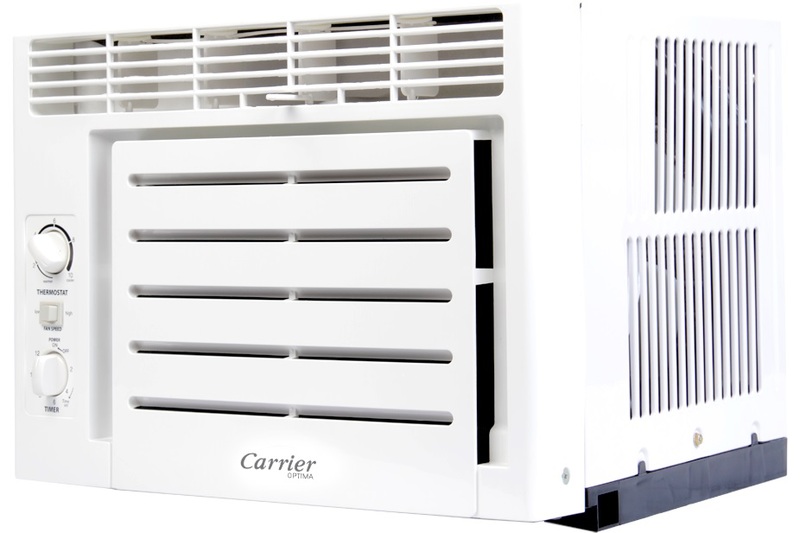 The Carrier Optima also reached the highest energy efficient ratio (EER) for the window room air conditioner category, with the Carrier Optima 0.75HP capacity reaching a high EER of 12.1. 53% more energy savings than other inverter brands. Another cooling solution in CCAC’s roster of air conditioners is the Carrier XPower 2. It comes with a stylish new grille and same guarantee of energy efficiency. Lab tests show that the Carrier XPower 2 gives as much as 53% more energy savings with a monthly cost to run of about P1,027 for eight hours of continuous cooling based on test conditions. for consumers who are conscious of their overall health and well-being. For consumers who like to keep tabs on their overall health and well-being, the Carrier iCool is the coolest and healthiest air cooling solution available in the market. It comes with an exclusive 8-in-1 filter system that blocks dust, pollution, viruses and allergens. What’s more, the Carrier iCool has an added dose of Vitaminc C and gingko extract to make sure you’re breathing only the healthiest air in your living space. With the company’s range of cooling solutions, Concepcion-Carrier puts a premium in producing energy efficient cooling solutions that helps you save on costs and lessen your carbon footprint. And with this lineup for 2013, you can enjoy both energy savings and exceptional cooling right in your own home. Great post! I was looking up carrier air conditioning units when I came across your post. I just bought a house with out air conditioning, so I have been looking up all my options. I heard carrier was the best! Is the first picture a window unit? Thanks for sharing.